September 23, 2010 – It’s about time. | What I got rid of today. ← September 22, 2010 – Postcard/picture holder. September 23, 2010 – It’s about time. Actually made it though a wash, rinse, and then dryer cycle...takes a licking, indeed. You know, that thing that makes you collect…things. So you always have one more…thing…than you probably should. ONE of my things is…watches. 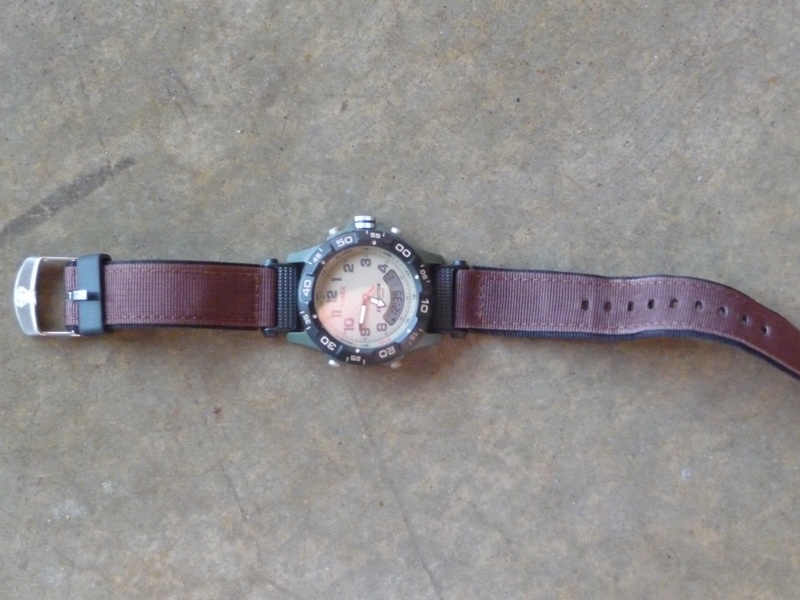 The watch above, I bought for watching movies. I’m not kidding. I specifically bought a watch with a light up dial so I’d always know how long the movie has left. So…today I try a few new…things. 1. How often am I really seeing movies in theater these days? 2. How about getting up and walking out on any movie that’s making me check my watch? 3. How about getting RID of a watch I’m wearing less than one time per month? This entry was posted in Clothing, Electronics. Bookmark the permalink. 2 Responses to September 23, 2010 – It’s about time. I just started on my own version of your project and while I’m happy to part with the objects that I’m getting rid of every day, I find that there is some locked monetary value in these items as a collective. For example, while an item might not fetch more than a few bucks if I sold it alone — making the effort not worth it — 50 or 100 items together make for a garage sale. I had one last summer and I raised $300, not bad for an afternoon with friends and meeting the neighbors. My question to you is: Are you giving all these items away or are you selling them? If you’re giving them away, how do you decide to whom? This watch in particular looks to have some monetary value. Most of the items were given to charity – given the nature of the project, I wanted to remove my attachments to them as quickly as possible.